I was lucky enough to spend time this weekend at Green River Farm, which has about 9 plots on roughly 20 acres south of Seattle. 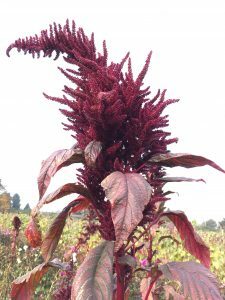 I got to meet the amazing Shua, who is farming about two acres of vegetables and flowers including dahlias, amaranth, asters, and zinnias. She is a total force of nature, with seemingly endless enthusiasm and laughter! It was wonderful to go on a little farm walk with her to see the operation in progress. 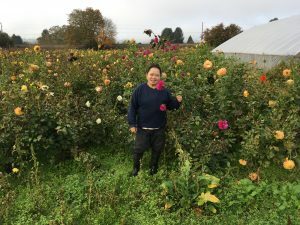 Shua’s flower farm is really unique because there is no irrigation. 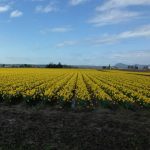 The soil is pretty clay-heavy, so it holds water quite well, but there is standing water in the early spring which makes early varietals a challenge. However, one of the projects she is working on now is irrigating her greenhouse, which will help with early and hot-weather varietals and expand her crop mix. 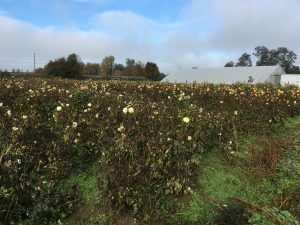 It was also interesting to see her dahlia fields, because they have already had a first frost. When that happens, the heat-loving dahlias basically turn black, signaling that it is time to dig them up. 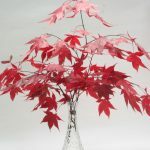 However, many of the plants still have blossoms on them, so it can be confusing to see them this time of year–the stems look harvestable but they aren’t. Shua said the frost came just one day after her last market, which is super lucky timing! 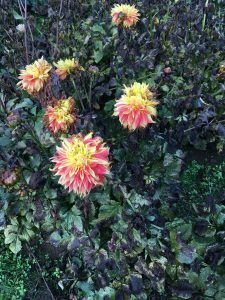 Shua told us she digs up and divides all of her dahlias every year, but selects what she keeps for the best flower colors, stem length, and productivity. Dahlias are really labor-intensive in this way, because if they are left in the field over winter, the entire tuber will rot. Shua also told us that her original tubers are 17 years old, and she has been dividing them ever since! Isn’t that amazing? I had a great time meeting Shua and talking to her about floriculture, land leasing, and markets. If you are in Puyallup for a farmer’s market next year, please look for Shua and buy some flowers from her. I may also be buying from her in the future!